Mega Man 11 is a classic take on Capcom's long-running series with a fresh new look. To build interest in the game leading up to its October release, a special demo showcasing a single boss has now been released on the Switch eShop. As previously noted, this demo allows players to take on a variety of enemies and overcome multiple traps in the Block Man stage. You'll also get to try out the Double Gear system which allows you to slow down time and power-up shots. The demo is available to download in both the UK and the US, so if you're not entirely sure if this is the right game for you, now might be the time to test it out. If you've enjoyed it, you can then pre-order the game - allowing you to play it as soon as it does become available on 2nd October. 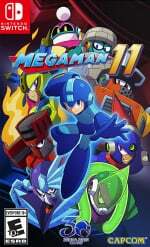 Are you still on the fence about Mega Man 11? Have you downloaded this demo and pre-ordered the game? Tell us below. Time to download Demo Man! After playing the demo I'm certainly interested. The controls feel great as expected, the visuals are good, and the combat and platforming combination is as enjoyable as ever. I'm not completely sold on the Double Gear system yet, but I'll wait and see how it works with the full game. Overall I'm not rushing to pre-order, but wishlist? Sure. I just noticed this while grabbing the demo for Swim Out. @HobbitGamer Oo yeah. I grabbed King of Monsters for that $4.79. Awesome! I love Mega Man so much. It's a must buy for me so the demo's just icing on the cake. The same here. Like Street Of Rage 4, the charm is gone. The truth is, if you want elegant and stylish pixelart, you have to invest a lot because it cost much more in term of time and money. I'll pass without any doubt. I might try it out. I must have been looking at the page before they put up the demo. Can't wait to try this game! @Cobalt SOR4 is not Flash, it’s hand drawn. If you read correctly I wrote : "AbodeFlashish"
It doesn't mean that IT'S flash but that kind of looks like. I did a fast try out(so not polished at all) of what I'd like to see for SOR4... I took "the new Axel" and I made my own version kind of. On second playthrough I found myself irritated there weren't enough buttons for a dedicated slide and rapid fire at the same time especially if the slide is as important as it was in this level. Rapid fire is super fun though. On third playthrough instead of Block Man's stage reminding me of Dust Man's, Block Man himself got dusted. Stop giving robot masters voice acting, thanks. @Cobalt I don’t know where you come from but I think MM11 looks stunning. Hell it look better than 2D and I love 2D. As others have said, this was surely supposed to be in the Direct today. Nonetheless, glad to see it's available now. I'll give it a download immediately! I prefer the X4 or ZX artstyle BY FAR ! Megaman 11 is like Bloodstained for me, just ugly. Do you guys think they’ll reshoot the direct because of the demos/games releasing today that might’ve maybe been in the direct? Just played through it and I feel more confident about purchasing it come October. I like the Double-Gear system, and unlike a lot of polygonal 2D platformers this one controls tight and snappy. Also the boss fight was far more interesting than the classic jump-around showdown. This is it! This is the Mega Man game I've been waiting on half my life. No seriously, probably more than half my life. Mega Man 3 was the very first video game I played in my entire life at the age of 7. I used to go into the local drugstore in Dallas and ask the cashier if they sold Mega Man toys. Because I didn't know any better at the time. And ever since the classic games, I've been waiting on the series to return with a modern style. Here it is, and it's gorgeous! This is the game Mighty No 9 was supposed to be, though in hindsight it could never have lived up to this. Because it's just not Mega Man. I want the real deal, and the real deal is finally here. If I had a NS, I'd be all over this demo! Sounds great! I totally forgot this was coming out so soon. WOOOOOOOO! @JaxonH I'm in a similar boat as you, although I started off with Mega Man 4. They did not learn from the PSP games, and obscured the hitboxes and hurtboxes with visual effects. I was all gung-ho and ready to buy and play this on vacation, but not now. Can they address this? I hope it's not the 2.5D in general. @Cobalt MM11 looks far more appealing visually than the trash present in Streets of rage 4. There's no comparison. I've lost all interest in SOR4...I can't take it seriously as a sequel and I'm dissapinted by the fact that Sega passed this opportunity up and passed it to another dev. An Indie dev that's responsible for that lousy looking wonder boy III visual overhaul which looks far less appealing than its original master system look. Visuals look god awful and axels beard and wardrobe look totally stupid! Streets of rage 2 already looks 10x better. I jumped on that demo ASAP, and it seems pretty good! I'll probably pre load soon. It's good to have Mega Man back. @NinChocolate - Gunna be real here, I think if it wasn't for M#9 even existing, Capcom may not have noted the desire for their game to return. 9's failures just make it that much more triumphant. His run cycle still looks off to me. I think his knees need to bend a little more every step. Also, he could stand to climb ladders a little faster, like Mega Man 3 climbing speed. Nice! Download it for tomorrow. Already planned on buying it day one (for Switch), love that we're getting a chance to play some of it early though. Nice to see more demos in recent years. I was relieved to see that the voice acting has its own volume slider in the options. It plays just like a classic Mega Man, though I feel that the text and some consumables look too small in handheld mode. Really like how the time of day changes the further you go through Block Man’s stage. I had to take a moment to gaze at the night sky before entering the boss room. Can’t wait to play the full game. I enjoyed it! I love the quick access to Rush. The few nasty little surprises were nice twists. I’ll have to get used to the gear system. I didn’t care for the music or his running animation. Will try it as soon as I get home from work! @WaveBoy So you need to go listen to Mega Man's voice in 8, because there is not a thing about it that has any "Sonic the Hedgehog," "edge," to it. That is a super... awfully childish voice. Dare I say... Mega childish? Not a good one, mind you. That voice acting was atrocious. But... You've crossed wires somewhere, or something. Whoops. Re-read that. Never mind. I was wrong. @KingBowser86 I legitimately fail to see what you mean. I haven't checked this demo out yet, but... Those PSP games were tight, if memory serves. Nothing seemed to off. @Frendo At least there is a fanmade Mega Man Maker available for PC for free. You should check that one out. It's using MM Classic Assets. I've never played a Megaman game before but it looks like fun. Consider the demo downloaded. @WaveBoy I understand your point but even if I don't really like the artstyle of dragon"s trap, at least it fits better the univers. I mean, it's not what I like but I can understand the "cartoonish hand draw" choice they did. With SOR4, goodbye the 90's vibe, goodbye the arcade feeling, goodbye the japanese touch etc... just horrible from my perspective. Now, I played all the megaman/rockman, all the Xs, the 2 Megaman ZXs, Rockman and Forte, all the megaman Zeros, some battle networks, some Star Forces and even the 2 power battle and guess what, they all look right and feel coherent with their univers. Megaman 11 looks like the horrible Shantae Half genie HERO OR DUCKTALES remaster, absolutely soulless. I agree, the controls feel good. The effects and enemies looks quite good. Thank God Megaman sounds like...a man and not an annoying girl. The music is annoying. Do they have to use the same high-pitched synth lead for every song? The stage is like a ghost town. Not enough enemies around and there's just not that much happening. Suddenly the difficulty gets ramped way up when you get to the miniboss. @nonprophetmusic MHX suffers more than MMPU, but they'll both have issues where platform discernment is difficult on-the-fly because of the art style, or the boxes don't line up with the 3D models. Thankfully, platform discernment was no issue at all here, but the boxes are still not lining up. Not to mention ladders don't function as quickly as they did before. Demo downloaded. The test will start soon. Thanks Capcom. Mega's voice is throwing me a bit lol, but I'll get used to it. In some ways the graphics look stunning. It almost looks 3D on my Switch and really pops. Overall, though, the artstyle looks like a cheap flash game. Likewise, the level design doesn't feel like classic MM quality. It's just bland. What a harsh critique. Just because we have a great pixel art in Octopath Traveler doesn't mean every series that started with pixel graphics has to follow suit or stay that way. Have you even played the Mega Man 11 demo, on a 4K TV and seen the game in motion? The art style is beautiful. The music, sound effects, implementation of the Double System = awesome/genius. Unlike Mega Man 10 and 11, this represents a true evolution of the classic series and feels like it can be the best classic Mega Man game (finally besting Mega Man 8). I've beaten all of the Mega man games you say you've beaten and I cannot believe you actually prefer the ZX/Zero series art style than Mega man 11. For handhelds they were fine but it's a bit too cutesy/chibi to look that modernized for HD screens. You my friend are truly trapped in the past. Pretty pumped to play the demo. Just playing Mega Man X for the first time and that's been great. This one looks like fun. Played it. Love it. Will buy it. Still haven't even reached Blackman yet. These games are harder than I remember them...or maybe with age I am losing my edge. First thing first, I don't think that the pixelart in Octopath is great. Now, I'm totally agree with you on the fact that a game doesn't have to stay the same way as it started. My only problem is when the artstyle change to follow a trend. megaman 11, Shantae Half genie Hero, Ducktale remaster, Mighty Number 9, Bloodstained, Rondo of Blood PSP, Bionic commando rearmed,Castle of illusion remake, Giana sisters Twisted Dreams, Double dragon neon etc... There are all made with the same way of doing. Players don't realise WHY ? I can tell you why... just because it cost too much to produce a real stylish and beautiful 2D pixelart and because the new generation don't have(for the majority of them) the skill to design something gorgeous. Defending the actual trend of ugly 2.5D is basically killing the beautiful 2D pixelart games. It starts with one game using that 2.5D and look now, they all do that because its cheaper, it involves less work and it requieres basic 3D skills to do simple 3D modeling. Just tried it out. Wasn't expecting the demo stage to be hard (in a challenging way.) Managed to make it to Block Man but still lost. I like the feel of the stage, it definitely feels like classic Mega Man besides being longer. The Gear Mechanic works swell too. Makes some of the enemies feel like little combat puzzles, especially the miniboss. Looking forward to the full game. @WaveBoy Have you ever heard his voice on Captain N: The Game Master cartoon from the late 80s / early 90s? It was much worse. The game is AMAZING, it feels so smooth in 3d animations. I liked the double gear, and the robot masters weapons with unique visual styles. Also forgot to add that I really need a japanese dub option. Megaman is suposed to sound girlish. I was really hyped about Part 11, but after the Demo... I mean, it's OK, but it's not that good, even if it's not the whole game. Maybe it's just because I played it after playing The Messenger. I dunno man. You're gonna have to give an example of what you mean by beautiful pixel art. You mean to tell me you didn't like the way Duck Tales Remastered or even Bloodstained Ritual of the Night looks? Like Duck Tales Remastered looks like the cartoon and Mega Man 11 looks like we're watching an evolution of its instruction booklet in motion. How is this art style considered ugly or cheap. You sound like we're talking about South Park style art here. Look at Blaze in Streets of Rage 4.... Would you rather look at her sprite design from the Sega Genesis? Seriously? The game is awesome and controls pretty tight. But, I like that they fixed his voice. His name is Mega "Man" afterall. After 10 games already and coming back from a 10 year hiatus I think he finally deserves to sound like one imo. @kevin74 amazing cartoon btw, absolutely love it haha. I'll take his troll-lile golbin voice In that cartoon(my favorite 80s cartoon of all time hehe) vs how he sounds in mm8 no question about it! It would of been really neat seeing a 32 but sprite based SOR sequel. Mega man X4, Rayman, castleVania sotn, mega man 8, metal slug, just to name a few are all examples of beautiful pixel art. And I agree the majority of new so called talent cannot whatsoever come close to the previous or so generations and so fourth. This applies to cartoons as well! @Turbo857 They changed his voice, that's it. But I miss his iconic japanose voice( wich everyone complains lol), his name is originaly Rockman anyway, and that doesn't chamge anything. I just want the option really. Great demo. I died on the treadmill mini boss, but getting better is kind of the point of MM games. Definitely getting this one. Anybody find any secrets or hidden walls or anything? I’ve beaten the stage several times and got it down. It was fun. @Capt_N Don’t you think its time to join the NS team? @WaveBoy You perfectly explained what I think about artstyle and your explanation about Cartoons is 100% the way I see them too. @Cobalt mega man 11 looks to suffer from the new super Mario Bros syndrome. Simple, bland, plastic and to the point. 😛....maybe I'm being just a tad harsh but you can still tell that it's a budget release and isn't taking full advantage of next Gen hardware, maybe not even the switch. @KingBowser86 I played the demo for a few minutes. Really, seemed pretty tight to me. Only thing I found difficult at one point was trying to jump UP into a space that Rock shoulda fit in with relative ease, but it was SUPER difficult and took like nine tries. I've been lovin' Mega Man since my introduction to the Battle Network series, so I'm onboard AF, still. I'd love to see that series return. Oh snap, what I'd do for two physical collections to cover all iterations in that series with some friggin' online battles, OMG. @WaveBoy To be fair, I've never played MM8, nor have I seen any videos of it, so I don't know what his voice sounds like in that game. Well, I would love to see an MM7-like Battle Mode out of this game (doesn't have to use the gears). I played the demo and being a Megaman fan for about 12 years I was extremely happy with Megaman 11. The double gear system seems meh at first, but it really does enchance and doesn’t feel like a gimmick. The music is on point so far, plus I love the art style too! Megaman 1-6 & 9-10 all had the same art style 8 bit I believe, as 7 and 8 had distinctive art styles. I love the look and feel of 11’s art and the controls feel comfortable and polished. Oh and it was refreshing to see the boss with desperation attacks and new patterns besides the standard typical pattern. @VR32X: I probably will, eventually. I feel the console is expensive for my wallet, at the moment. I also just have this bad feeling, Nintendo will drop it, as soon as it gets in a jam, like they kind of did with WU. I will say, however, there are a handful of games for the system, in addition to the 1st party you can only get on Nintendo's hardware. MM11 is a fresh of breath air thanks to its 3D visual overhaul and art direction, gear system, the ability for robot masters to transform ect rather than sticking to the tried and true formula. IMO, mm3 felt rushed and is nowhere near as great as a lot of people say it is, 4 is a mixed bag and 5 & 6 should of NEVER been made on the nes period. Those two were terrible. It was overkill at that point...heck I was burnt out with MM4 during its release. Meanwhile 8 had a god awful soundtrack, with irritating voice work. I do like the original and 7 though hehe. @Capt_N Bought mine with my taxes last year, or I wouldn’t have one. I was going to be a total Scrooge and just stick with my Wii U and 3DS, and say “well, I put too much into these and I really don’t need this too.” However, my friends were getting them and had a feeling Monster Hunter was coming to it. Foolish maybe, but I bought the system with Zelda’s Master Edition on a whim. Now I have too many titles on it. My cart slots got full in my Master Edition carrying pouch, and I got a power tag to keep a certain needed amiibo with me when I wasn’t home. I bought a $35 eShop card last night to have $20 set aside for the online service. So I went to look at my wishlist and there were just too many games. Each Thursday the eShop gets slammed with more games than the Wii U or 3DS ever did. I have absolutely no way of keeping up. I doubt they’ll ditch it. If anything they’ll release a new Switch model like they did with 3DS. Its a crazy different experience than Wii U. Hope you get one soon! @WaveBoy Yeah 9 was a beast, also 7 was great for many reasons too. @SonicSpeedX 2, 9 and 7 are the best hands down. Although, 2 hasn't aged as well as the other two. Controls are a little slower, not as quick or kinetic, the ladder climbing is slow, some of the boss battles feel sloppy, the stages in wilys fortress(awesome boss battles aside) weren't anything special etc. @VR32X: Thanks for sharing! I will probably get one later this year, or next summer. I gotta be honest, I expected to love this and I just don't. Something just feels phoned-in to me, I can't really explain it. I have SO many amazing action platformers (including the fantastic 20XX) so this just doesn't feel essential to me. No worries, it saves me $30 lol, which doesn't happen often as a Switch owner!